The Green Bay Packers were 9-1 and in a battle with the Chicago Bears in the NFL Western Division as they took on the Washington Redskins in their season finale on November 30, 1941. 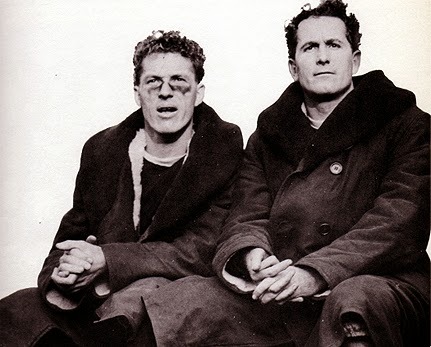 Head Coach Curly Lambeau’s team benefited from the passing of tailback Cecil Isbell and the pass receiving of superb end Don Hutson (Hutson, left, and Isbell pictured above). Isbell could run, too, and the stable of backs led by FB Clarke Hinkle was a good one. Washington, coached by Ray Flaherty, had lost three straight games after starting the season at 5-1 and the Redskins were now 5-4 as they hosted the Packers. TB Sammy Baugh, who split time with Frank Filchock, was one of the NFL’s most productive passers and the team benefited from the addition of C/LB Ki Aldrich, who was obtained through a trade with the Cardinals. It was a warm day at Griffith Stadium with 35,594 fans in attendance. The Redskins took the opening kickoff and drove 67 yards. Tailback Frank Filchock completed passes for first downs to back Roy Zimmerman and end Joe Aguirre. The series was capped by Filchock running for a 10-yard touchdown on a fake reverse. Aguirre kicked the extra point. Green Bay managed one first down in response as Cecil Isbell threw to end Don Hutson for 15 yards, but the Packers had to punt. Washington again moved the ball on offense, with FB Bob Seymour (pictured at left) the standout, advancing 50 yards before Bob Masterson kicked a 28-yard field goal. Heading into the second quarter, the Redskins expanded their lead. Sammy Baugh entered the game for Washington and made a big play on defense as he intercepted an Isbell pass and returned it to near midfield. Following a nine-yard run by FB Andy Farkas, Baugh threw long for Seymour and it was complete for a 41-yard TD. A bad snap from center nearly thwarted the extra point attempt, but Baugh grabbed the ball and Ki Aldrich was able to make the kick. The home team was up by a 17-0 score. The Packers got two first downs before Isbell was twice tossed for losses and then Aldrich intercepted a pass and returned it 41 yards to the Green Bay 41. The Packers got the ball back when Farkas fumbled, gave it back up on another interception, and regained it once more on a fumble by Seymour. TB Hal Van Every threw to HB Andy Uram for a 30-yard gain with less than a minute remaining in the first half, but after TB Tony Canadeo picked up a first down, the clock ran out with the score unchanged. Green Bay had been unable to sustain drives in the first half, but the result was very different in the third quarter. 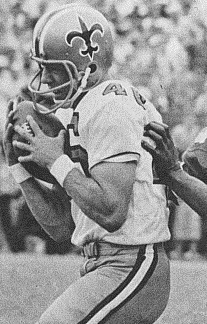 First, LB George Svendsen recovered a Farkas fumble at the Green Bay 28 and Isbell proceeded to pass the Packers down the field. Reaching the Washington 15, he then ran seven yards for a first down and the series concluded with his throw to Hutson for a touchdown from eight yards out. Hutson’s try for the extra point missed, but the visitors were on the board. The Redskins responded by once again moving the ball effectively, but Filchock’s pass from his own 45 was intercepted by Svendsen, who returned it 45 yards to the Washington three. FB Clarke Hinkle hit the line twice without success before Isbell, facing third-and-goal, again connected with Hutson for a three-yard TD. This time Hutson successfully converted and the Packers were down by just 17-13 heading into the final period. Following a short possession by the Redskins, Green Bay started the next series at its own 33. Isbell ran for five yards and then hit on short passes to Hutson and HB Herm Rohrig. He then went long for Hutson and the result was a 40-yard touchdown. Hutson again added the PAT and the visitors were up by 20-17. On the ensuing kickoff, back Ray Hare fumbled at his three, recovered, and retreated into his end zone for a safety that increased the Green Bay lead to five points. Washington was unable to come back despite Baugh’s best efforts. In a series that started from the Washington 14, “Slingin’ Sammy” passed the team down the field with completions to end Al Krueger and McChesney. But after getting to the Green Bay 16, the Packers held and the Redskins turned the ball over on downs. Getting one last shot in the final minute, Baugh threw a desperation pass that Uram picked off to seal the 22-17 win for the Packers. Green Bay led in total yards (388 to 331) while the Redskins had more first downs (18 to 14). Washington turned the ball over five times, to four suffered by the Packers, who gave up three interceptions in the first half, but none during the second half comeback. Don Hutson caught 9 passes for 135 yards and three touchdowns, all on throws from Cecil Isbell. The Packers ended up tied with the Bears on top of the Western Division with a 10-1 record. They had split with Chicago during the regular season, but it was the Bears handily coming out on top in the playoff for the division title. Washington ended up at 6-5, placing third in the Eastern Division. Don Hutson led the NFL in pass receiving (58), pass receiving yards (738), and TD receptions (10), as well as touchdowns overall (12, tied with George McAfee of the Bears) and scoring (95 points, a new NFL record). He was recipient of the Joe F. Carr Trophy as league MVP. Cecil Isbell topped the circuit in pass attempts (206), completions (117), yards (1479), and TD passes (15), among other categories. Both were consensus first-team All-NFL selections. The New England Patriots were 6-5 and fighting to stay in the playoff hunt as they hosted the division-rival Buffalo Bills on November 29, 1998. 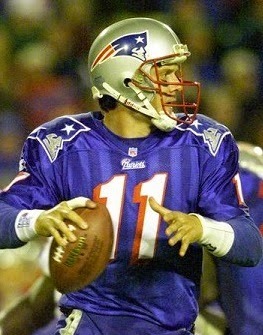 To add to New England’s concerns, QB Drew Bledsoe (pictured above) was playing with a splint on his throwing hand due to a broken finger suffered the previous week, when he had still managed to toss a late scoring pass to pull out a win. Prior to that, Head Coach Pete Carroll’s team had lost four of five games, but the offense was helped by the return from injury of WR Terry Glenn. Buffalo, coached by Wade Phillips, was 7-4 and had beaten the Patriots at home two weeks earlier. Diminutive QB Doug Flutie, former Boston College star and CFL legend, replaced Rob Johnson, the young quarterback the team had swung a deal with Jacksonville to obtain, with good results. WR Eric Moulds was a big-play talent across from 34-year-old WR Andre Reed and, with RB Thurman Thomas entering the twilight of his great career, RB Antowain Smith emerged as a productive starter. DE Bruce Smith was still a key player on the defensive line, along with NT Ted Washington. There were 58,304 fans in attendance at Foxboro Stadium. Buffalo had the first possession and Doug Flutie completed his first three passes, but the drive stalled at the New England 45 and the Bills punted. They got the ball back in short order when CB Thomas Smith intercepted a pass by Drew Bledsoe at the Buffalo 12. Flutie completed a throw to Eric Moulds for 33 yards and the long series finally ended at the New England 17 where the Bills came up empty when Steve Christie missed a 35-yard field goal attempt. The teams exchanged punts as the game headed into the second quarter. The Patriots then put together a 66-yard drive in eight plays. 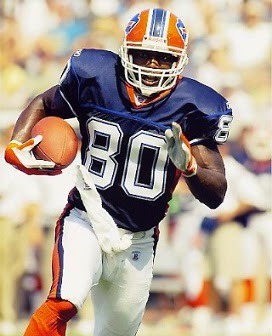 Bledsoe threw to Terry Glenn for 15 and 33 yards and TE Ben Coates for 12 to reach the Buffalo nine. A pass interference penalty moved the ball to the one, and after two carries by RB Robert Edwards netted a loss of a yard, Bledsoe passed to him for a two-yard touchdown. Adam Vinatieri added the extra point for the 7-0 lead. Once again the Bills had to punt following their next possession, and once again the Patriots drove to a score. This time it took them seven plays to advance 53 yards, having gotten a 30-yard punt return from CB Chris Canty to give them good starting field position. Bledsoe completed five passes, with gains of 12 yards to Glenn, 13 to Coates, and finally a 12-yard TD throw to RB Derrick Cullors. Vinatieri kicked the point after to expand the New England lead to 14-0. Down by two touchdowns, the Bills got a break on the next series when the Patriots were flagged for pass interference on a third-and-10 play that picked up 26 yards. Antowain Smith followed up with three runs that totaled 22 yards to the New England 38. A Flutie pass and another run by Smith picked up another ten yards, but that was it and Christie came on to kick a 34-yard field goal. With 1:16 remaining in the first half, the Patriots responded with Bledsoe completing three straight short passes. However, a third-down sack forced a punt and the Bills, starting from their 37 with the clock now down to 18 seconds, got a 55-yard gain on a pass from Flutie to WR Kevin Williams. Christie kicked a 26-yard field goal on the last play before halftime and the score stood at 14-6 at the game’s midpoint. Following a punt by the Patriots to finish off the first series of the third quarter, Buffalo struck quickly when Flutie (pictured at left) connected with Moulds for an 84-yard touchdown. The pass for a two-point conversion failed, but the visitors were now only two points behind. Short Bledsoe passes and the running of Edwards moved the Patriots down the field on the next possession, and Vinatieri booted a 44-yard field goal to expand New England’s lead to 17-12. But the Bills came back with another score of their own on a series in which Flutie completed passes to Andre Reed for 23 yards and Moulds for 17. With a second-and-goal at the four, they were unable to reach the end zone, but Christie kicked a 22-yard field goal to again narrow the margin to two points at 17-15. As the contest entered the fourth quarter, the Patriots again had to punt and Buffalo put together a long, penalty-filled drive of 67 yards. A defensive holding penalty converted a third-and-16 situation and an illegal-use-of-hands call turned a third-and-four play into a first down. Flutie completed four passes, one to Williams to convert yet another third and long that picked up 22 yards, although an apparent 23-yard completion to Reed was called back for holding. Finally, Flutie threw to Reed for a touchdown from four yards out and, while the two-point conversion attempt again failed, the Bills were in front by 21-17. The Patriots came up empty on their next series when Vinatieri missed a 47-yard field goal attempt. After Buffalo’s next possession resulted in a punt just after the two-minute warning, New England started off at its 18 and had no remaining timeouts. Bledsoe completed four of five passes, two of them to Coates, as the Patriots advanced to the Buffalo 37. However, the drive stalled there until, on fourth-and-nine, a pass lofted toward Glenn in the end zone was incomplete but Buffalo was called for pass interference. The ball was moved to the one, much to the fury of the Bills. With no time left on the clock, Bledsoe connected with Coates for a touchdown and, with the angry Bills having already departed for the locker room, Vinatieri ran for an unopposed two-point conversion rather than kicking. The Patriots came away with a dramatic 25-21 win. Buffalo had a sizable lead in total yards (428 to 259) and time of possession (34:01 to 24:59), although New England had the edge in first downs (24 to 23). The Bills also recorded four sacks, to one by the Patriots, and New England suffered the only turnover. But Buffalo was penalized 12 times, at a cost of 107 yards, which in the end proved fatal, while the Patriots drew 9 flags for 80 yards. Drew Bledsoe completed 28 of 43 passes for 246 yards and three touchdowns while giving up one interception. Ben Coates (pictured at right) had 10 catches for 70 yards and the game-winning TD and Terry Glenn gained 104 yards on 8 receptions. Robert Edwards led New England in rushing with 40 yards on 13 carries. 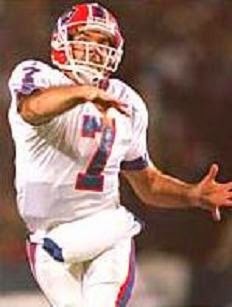 For the Bills, Doug Flutie was successful on 21 of 39 throws for 339 yards and two TDs and no interceptions. He also ran for 30 yards on five carries. Eric Moulds caught 8 passes for 177 yards and the long touchdown. Kevin Williams contributed 74 yards on his four receptions and Andre Reed accounted for 53 yards and a TD on his four. Antowain Smith rushed for 58 yards on 21 attempts. “Well, [the officials] gave them the game, they might as well give them the extra point,” added Coach Phillips, also making reference to the unopposed two-point conversion at the end. The win tied the Patriots with the Bills as they remained in the playoff mix, but they split their last two contests, including a loss to the division-winning Jets in the finale, to finish fourth in the AFC East at 9-7. It was still enough to make it in to the postseason with the last Wild Card spot and they lost to Jacksonville in the first round. Buffalo was third with a 10-6 record and lost to Miami, the second-place team, in the Wild Card playoff. Drew Bledsoe, who missed the last two games and the playoff loss due to injury, ended up passing for 3633 yards and 20 touchdowns. 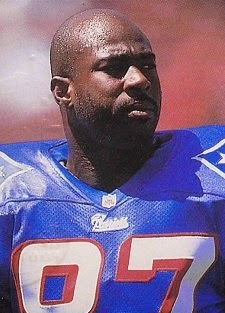 Ben Coates led the team with 67 pass receptions, for 668 yards (10.0 avg.) and six TDs. He was named to the Pro Bowl for the fifth straight year. Doug Flutie and Eric Moulds were also selected to the Pro Bowl. The 36-year-old Flutie threw for 2711 yards and 20 touchdowns and ran for another 248 yards while the team went 7-3 with him as the starting quarterback. Moulds (pictured below) averaged 20.4 yards on his 67 catches for an AFC-leading 1368 yards with nine TDs. White was a wingback in college who scored 43 touchdowns overall and was Southwestern Athletic Conference Co-Offensive Player of the Year in 1975. He was chosen by the Vikings in the second round of the ’76 NFL draft and he moved into the starting role vacated by John Gilliam, who had departed for the Falcons. Vikings went 11-2-1 to finish first in the NFC Central while leading the conference in passing yards (2855). Won NFC Divisional playoff over Washington Redskins (35-20) and NFC Championship over Los Angeles Rams (24-13). Lost Super Bowl to Oakland Raiders (32-14). 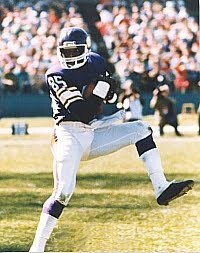 Fast and a potent deep receiver, and benefiting from the presence of Ahmad Rashad on the other side, White had another Pro Bowl year in 1977 as he caught 41 passes for 760 yards (18.5 avg.) and nine touchdowns. While he was not chosen to the Pro Bowl again, he remained a consistent and productive receiver, peaking with a 1981 season in which he achieved career highs in receptions (66) and yards (1001). White missed five games due to a muscle pull in 1983 and further injuries limited his effectiveness in his last two seasons of 1984 and ’85. Over the course of ten seasons that were all with the Vikings, White caught 393 passes for 6400 yards (16.3 avg.) and 50 touchdowns, and he had another 17 catches for 313 yards (18.4 avg.) and five TDs in the postseason. The Cleveland Browns were 6-4 and, in this first season in which the NFL conferences were broken down into divisions, at the top of the Century Divison of the Eastern Conference as they hosted the Washington Redskins on November 26, 1967. Head Coach Blanton Collier’s Browns had an outstanding running tandem in HB Leroy Kelly (pictured at right) and FB Ernie Green. Despite assorted injuries, Frank Ryan was still an effective quarterback and had excellent receivers in split end Paul Warfield and flanker Gary Collins. The Redskins were coached by an ex-quarterback, Otto Graham, and boasted an outstanding aerial game that generated lots of points. 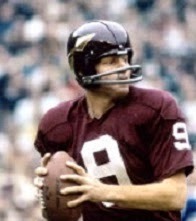 QB Sonny Jurgensen was an accomplished passer and had a receiving corps of split end Charley Taylor, flanker Bobby Mitchell, and TE Jerry Smith that was top rate. However, the running game was far less impressive and the defense could give up points as readily as the offense could score. Washington had a mediocre 4-4-2 record but was coming off of two straight wins. There were 72,798 fans in attendance at Municipal Stadium in Cleveland. The Browns had the first possession and moved methodically and mostly on the ground with Leroy Kelly and Ernie Green carrying the load. Finally, Kelly took a flip from Frank Ryan and sped 42 yards for a touchdown to conclude the 10-play series. The venerable Lou Groza, in his 21st year at age 43, added the extra point. 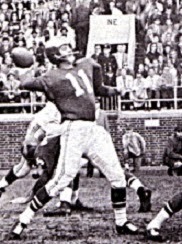 Washington responded by advancing into Cleveland territory as Sonny Jurgensen completed four passes, but another was deflected by DE Paul Wiggin and LB Johnny Brewer (pictured at left) intercepted and returned it 70 yards for a TD. Groza’s PAT put the Browns ahead by 14-0. The Redskins advanced quickly to midfield on their next possession. HB Gerry Allen ran around end for a 30-yard gain, and he and FB A.D. Whitfield combined for another 11 yards. Jurgensen threw to Charley Taylor for eight yards to reach the Cleveland 31, but the drive stalled there and, trying to convert a fourth-and-two situation, Jurgensen was sacked by Brewer. The Browns punted to finish out the opening period and Washington started off the second quarter by going 59 yards in five plays. Jurgensen connected with Jerry Smith for 14 yards on a third-and-seven play and then threw to Taylor for a 23-yard touchdown. Gene Mingo converted and the home team’s lead was cut to 14-7. 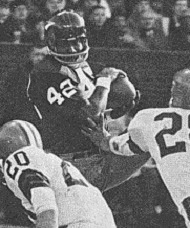 Ryan threw to Paul Warfield for 23 yards as the Browns reached their 45 on the next series, but on the next play Green fumbled the handoff and CB Rickie Harris recovered for the Redskins. Jurgensen completed two passes to Whitfield, the second for 24 yards to the Cleveland 20, but three incompletions were followed by a 27-yard Mingo field goal. However, the Browns quickly expanded their margin again when DB Carl Ward returned the ensuing kickoff 104 yards for a touchdown. Groza’s point after made the tally 21-10. Jurgensen again passed the Redskins into Cleveland territory, thanks to two completions to Bobby Mitchell, but after Allen was thrown for a loss on a running play, Taylor dropped a pass and, on third-and-12, Jurgensen was sacked to force the visitors to punt. It took the Browns just four plays to score again, with Ryan passing to Warfield (pictured below) down the left sideline for a 48-yard TD. Groza again converted and Cleveland was up by 28-10. With less than four minutes remaining in the first half, Jurgensen came out passing on Washington’s next series. Five of them hit the mark, with the last to Taylor for a 15-yard touchdown. Mingo’s successful extra point again made it an 11-point contest. There was time enough for the Browns to make one last try to add points before halftime, and Kelly gained 30 yards on a sweep to near midfield. However, Groza’s field goal attempt from 42 yards was short and the score remained 28-17 at the intermission. The Redskins had a short series and punted to start off the third quarter. Cleveland advanced 68 yards in six plays, the big one a swing pass by Ryan to Kelly that gained 48 yards to the Washington 21. A pass into the end zone drew a penalty for face-guarding and Green ran for the final yard and a TD. Groza’s extra point made the home team’s lead 35-17. In response, the Redskins drove 75 yards. The hardly-nimble Jurgensen scrambled for 21 yards to convert a third-and-nine situation and he had back-to-back pass completions to Whitfield for 21 and 11 yards to reach the Cleveland 20. Now it was the turn of the Browns to make a penalty on a pass into the end zone, in this instance a pass interference call on DB Ben Davis, and Allen ran for a one-yard TD. Mingo converted and once more the margin was 11 points at 35-24. The Browns had to punt on the next series after an unsportsmanlike conduct penalty moved them out of field goal range and Washington punted in turn. Cleveland was on the move as the game moved into the fourth quarter, helped along by the running of Kelly and Green and a 20-yard gain on a pass from Ryan to Gary Collins. Kelly ran for a 21-yard touchdown and Groza’s PAT staked the Browns to a big 42-24 margin. The Redskins struck back quickly. On the fourth play of the ensuing series, Jurgensen went long for Mitchell and the result was a 48-yard TD. Mingo’s kick made the score 42-31. The teams then traded punts before Washington put together another scoring drive. Jurgensen completed four straight passes, two of them to Taylor (pictured below), and one to Whitfield for 12 yards to the Cleveland one, from where Allen went over for the touchdown. Mingo’s extra point attempt was partially blocked and hit the crossbar, thus keeping it a five-point margin. There were less than three minutes remaining in the game and Kelly ran for 18 yards on Cleveland’s next play from scrimmage, but the Browns could get no more first downs and punted. With the clock down to 1:33, Jurgensen went to the air, completing passes to Jerry Smith for 17 and 21 yards and to Taylor for 19 to the Cleveland 25. But that was as close as the Redskins were able to get. The next three passes were incomplete, with one of them barely deflected by CB Erich Barnes in the end zone, and DE Bill Glass flattened Jurgensen on fourth down to effectively end the contest. Cleveland held on to win by a final score of 42-37. Washington had the edge in total yards (481 to 424) and first downs (33 to 19). Most of those yards came through the air as the Redskins generated 373 net passing yards, although Cleveland accumulated 203 yards on the ground. The Browns also recorded five sacks, to two by Washington, and each team turned the ball over one time apiece. Cleveland was penalized 10 times, at a cost of 148 yards, to six flags for 49 yards thrown on the Redskins. Ultimately, the interception and kickoff returns for touchdowns were the keys for the Browns. Leroy Kelly rushed for 163 yards on 20 carries that included two touchdowns and also gained another 44 yards on two pass receptions. Frank Ryan didn’t go to the air often, completing 11 of 17 passes, but they were good for 233 yards and a TD while none were intercepted. Paul Warfield caught three passes for 96 yards and a score and Gary Collins contributed three receptions also, for 58 yards. For the Redskins, Sonny Jurgensen had a huge performance in defeat, going to the air 50 times and completing 32 for 418 yards with three touchdowns against one interception. Three receivers went over a hundred yards, with Charley Taylor leading as he caught 11 passes for 123 yards and two TDs. Bobby Mitchell gained 106 yards on his 6 receptions that included a score and A.D. Whitfield accumulated 102 yards on 8 catches out of the backfield. Whitfield also rushed for 28 yards on 14 carries while Gerry Allen led the club with 59 yards on 14 attempts that included two short touchdowns. The win kept the Browns a game ahead of the Giants in the Century Division and they stayed on top with a final record of 9-5. However, they were pulverized by the Cowboys in the Eastern Conference playoff. Washington ended up at 5-6-3 for third place in the Capitol Division. Leroy Kelly passed the thousand-yard threshold for the second straight year with his fine performance against the Redskins and went on to lead the NFL in rushing with 1205 yards on 235 carries (5.1 avg.) and 11 touchdowns. He was a consensus first-team All-NFL selection and also was named to the Pro Bowl. Sonny Jurgensen (pictured at right) set new NFL records with 508 pass attempts, 288 completions, and 3747 yards (Joe Namath threw for 4007 yards in the AFL). He also led the league in TD passes (31) and passing overall (87.3 rating) and was chosen to the Pro Bowl. The 418-yard performance against Cleveland ended up being the third-highest of his Hall of Fame career. 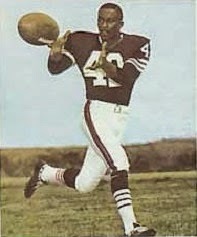 Charley Taylor was a consensus first-team All-NFL and Pro Bowl choice as he led the NFL with 70 pass receptions, which were good for 990 yards and nine TDs. 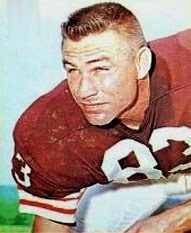 Indeed, he, Jerry Smith, and Bobby Mitchell placed first, second, and fourth, respectively, among the league’s pass receiving leaders. Abramowicz caught 120 passes for 1685 yards and 14 touchdowns in college but was considered too slow by pro scouts and the expansion Saints took him in the 17th round of the 1967 NFL draft. He moved into the starting lineup midway through his rookie season and caught 50 passes for 721 yards (14.4 avg.) and six TDs. What Abramowicz lacked in speed he made up for with reliability and a knack for getting open. He followed up in 1968 with 54 receptions for 890 yards (16.5 avg.) and seven touchdowns. Saints went 5-9 to finish third in the Capitol Division of the NFL Eastern Conference. Abramowicz followed up with 55 catches for 906 yards (16.5 avg.) and five touchdowns in 1970. While still a well-regarded possession receiver, his numbers dropped in 1971 and ’72 and he was traded to San Francisco during the 1973 season, where he caught 35 passes for 442 yards (12.6 avg.). Following one more year with the 49ers, he was briefly with the Buffalo Bills, catching no passes in 1975, his final NFL season. Along the way, he caught at least one pass in 105 consecutive games, which was the NFL record at the time. Overall, Abramowicz had 369 catches for 5686 yards (15.4 avg.) and 39 touchdowns. 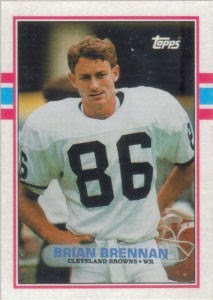 He was one of the first two players named to the New Orleans Saints Hall of Fame in 1988 (along with Archie Manning). The Cleveland Browns were 7-4, but coming off of a bad loss to the Raiders, as they hosted their fierce rivals, the Pittsburgh Steelers, on November 23, 1986. Coached by Marty Schottenheimer, the Browns were benefiting from the rapid development of QB Bernie Kosar (pictured at right), who was two days short of his 23rd birthday. TE Ozzie Newsome was nagged by injuries, as were the running backs, but wide receivers Webster Slaughter, Reggie Langhorne, and Brian Brennan were steady. The Steelers, under the guidance of Head Coach Chuck Noll for the 18th year, had gotten off to a 1-6 start but were now 4-7. QB Mark Malone was inconsistent but playing better after missing two weeks due to a thumb injury. Running backs Walter Abercrombie and Earnest Jackson were effective running behind a good line. The defensive line was lacking when it came to rushing opposing passers and CB Dwayne Woodruff, their best in the backfield at coverage, had gone down for the year in the preseason. It was a rainy day at Cleveland Municipal Stadium with 76,452 fans in attendance. The Steelers had first possession and drove 75 yards in eight plays. The big one was a pass from Mark Malone to WR Louis Lipps that picked up 44 yards to the Cleveland nine yard line. Walter Abercrombie ran for a one-yard touchdown and Gary Anderson added the extra point. The teams exchanged punts before the Browns put together a promising drive. Bernie Kosar completed a third-and-10 pass to WR Clarence Weathers that gained 15 yards and throws to Brian Brennan picked up 28 and 21 yards. But after reaching the Pittsburgh four, a holding penalty nullified an apparent touchdown run and Kosar threw a pass that was intercepted by LB Bryan Hinkle. The Steelers had to punt following a short series and Cleveland was again on the move as the game headed into the second quarter. Kosar connected with FB Kevin Mack for six yards and RB Curtis Dickey for four and two carries by Mack gained another nine yards. Kosar than threw to TE Harry Holt for 23 yards to the Pittsburgh 10 and, following a pass interference penalty, Dickey swept around left end for a two-yard TD to finish off the six-play, 53-yard series. Matt Bahr’s successful conversion tied the score at 7-7. On Pittsburgh’s next offensive play, Malone’s errant pass was picked off by CB Mark Harper who returned it 31 yards to the Steelers’ 15. Five plays later Mack scored a touchdown from a yard out and, with Bahr kicking the point after, the Browns were now ahead by 14-7. The Steelers responded with a scoring drive of their own that covered 61 yards in five plays. Malone completed two passes and Abercrombie took a pitchout and ran 38 yards for a TD. Anderson’s kick tied the score again at 14-14. The Browns wasted no time in regaining the lead. Kosar threw to Webster Slaughter for 31 yards and passes to RB Herman Fontenot and Reggie Langhorne gained another 14 to the Pittsburgh 35. A defensive holding penalty was followed by a nine-yard run by Mack and Kosar then connected with TE Ozzie Newsome for a 20-yard touchdown. Bahr converted and the score was 21-14. DB Lupe Sanchez returned the ensuing kickoff 58 yards to the Cleveland 40, but after the drive stalled at the 28, Anderson missed a 45-yard field goal attempt. With the clock down to 1:42 remaining in the first half, Kosar passed the Browns into Pittsburgh territory but Bahr was also unsuccessful on a 39-yard field goal try and the score remained unchanged at halftime. Cleveland had the ball first in the third quarter and punted. The Steelers then drove 63 yards in nine plays to put more points on the board. Malone had completions to TE Preston Gothard for 19 yards and Lipps for 16. A pass interference penalty moved the ball to the Cleveland two and, two plays later, Malone scored a touchdown from a yard out on a quarterback sneak. Anderson knotted the score at 21-21 with the extra point. The Browns responded strongly as Kosar completed three passes to Langhorne, the first for 20 yards in a second-and-17 situation and the second for 21 yards to convert on third-and-nine. A replay overturned what was originally called a fumble by Kosar to keep the drive alive and Dickey finished off the 12-play, 76-yard series with a four yard touchdown carry. With Bahr adding the PAT, the home team was back on top by 28-21. Pittsburgh was driving again as the game headed into the fourth quarter. Abercrombie (pictured at left) and Earnest Jackson had good gains and Malone converted a third down with an 11-yard completion to Lipps. Once again it was Malone keeping the ball himself for the final yard and a TD to cap the 11-play, 69-yard possession and, with Anderson’s extra point, the score was tied once more at 28-28. Kosar went to the air on the next series and connected with Fontenot for 16 yards and Slaughter for 32 as the Browns advanced to the Pittsburgh 28. The drive stalled, however, and Bahr missed wide to the left on a 45-yard field goal attempt. The Steelers went three-and-out and had to punt, and this time the Browns had a better result. Driving 64 yards in 14 plays, Kosar completed four passes and Mack and Dickey chipped away on the ground. A throw to Slaughter picked up 22 yards to the Pittsburgh 11 in a third-and-seven situation and, four plays later, Bahr made good on a 25-yard field goal try. Cleveland was up by three with 1:55 to play in regulation. Starting from their 40 following the ensuing kickoff, the Steelers advanced 37 yards in nine plays. Malone hit on passes to Abercrombie for four yards and Lipps for 14. After RB Rich Erenberg dropped a pass with a clear field in front of him, he caught two throws from Malone for eight and five yards to get a first down. Finally, after two runs got the ball to the Cleveland 23, Anderson kicked a 40-yard field goal to knot the score at 31-31 with 11 seconds remaining, thus sending the game into overtime. Cleveland’s placekicker Matt Bahr suffered knee ligament damage making the tackle on his last kickoff (which proved to be season-ending) and put the Browns at a disadvantage heading into OT because the reserve tight end Holt was the emergency backup and had never attempted a placekick in the NFL. Both teams had short possessions to start the extra period. 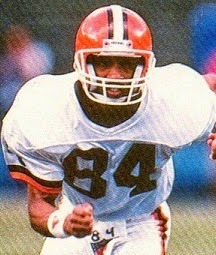 Cleveland WR Gerald “Ice Cube” McNeil had a 15-yard return that gave the Browns the ball at their 40. 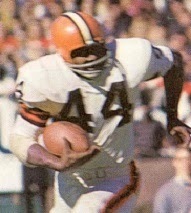 Mack ran four straight times to pick up 15 yards and Kosar, eluding a heavy rush in a third-and-seven situation, threw to Fontenot for another nine yards before connecting with Slaughter (pictured below) for a 36-yard touchdown to win the game by a final score of 37-31. Despite the back-and-forth nature of the game and the closeness of the score, the Browns dominated in total yards (536 to 339), first downs (35 to 20), and time of possession (40:17 to 26:20). Each team turned the ball over one time apiece. Both teams had difficulties with field goals as Gary Anderson missed one from just inside 40 yards and Matt Bahr was unsuccessful on two of his three tries. 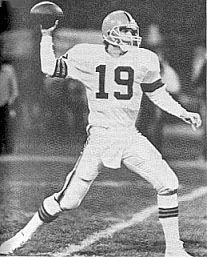 Bernie Kosar had a big performance, completing 28 of 46 passes for 414 yards and two touchdowns while giving up one interception. Webster Slaughter had 6 catches for 134 yards and the game-winning TD while Brian Brennan contributed five receptions for 87 yards and Herman Fontenot added 46 yards on his five catches. Kevin Mack rushed for 106 yards on 24 carries that included a touchdown. For the Steelers, Mark Malone succeeded on 17 of 28 throws for 197 yards and was intercepted once. Walter Abercrombie gained 86 yards on 15 carries that included two TDs and caught four passes for another 26 yards. Louis Lipps gained 85 yards on his four receptions and John Stallworth also caught four, for 48 yards. Cleveland won its remaining regular season games to place first the AFC Central for the second straight year with a conference-best 12-4 record. The Browns defeated the Jets in the Divisional playoff round but lost the NFC Championship game to Denver. Meanwhile, the loss officially eliminated the Steelers from playoff contention. They ended up at 6-10 and third in the division. Bernie Kosar passed for 3854 yards, which ranked fourth in the league, and threw 17 touchdowns with just 10 interceptions, giving him a league-low 1.9 interception percentage. He displayed his ability as a clutch performer by topping the NFL with seven game-winning drives. The 414 passing yards against the Steelers remained his career high. The Raiders made their long-delayed regular season home debut as a Los Angeles team against the San Diego Chargers on November 22, 1982. Having made the move from Oakland to LA in the face of much resistance from the NFL, the Raiders won their first two games on the road before the 57-day players’ strike put the entire league on hiatus. The Raiders, coached by Tom Flores, fell to 7-9 in ’81, which was their first sub-.500 record since 1964, and were looking to rebound. 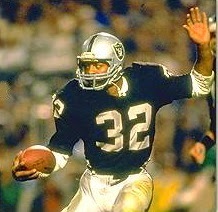 QB Jim Plunkett had been troubled by injuries but was healthy again and HB Marcus Allen (pictured above), the first draft choice out of USC, was a welcome addition to the offense – indeed, the game against the Chargers marked his return to the stadium where he had starred in college and won the Heisman Trophy. Todd Christensen took over as starting tight end in place of the injured Derrick Ramsey with promising results. On defense, DE Lyle Alzado was obtained from the Browns and combined with second-year DE Howie Long to provide an enhanced pass rush. San Diego came into the game at 1-1 following the long layoff. Under offensive-minded Head Coach Don Coryell, the Chargers boasted the league’s most prolific passing attack, guided by QB Dan Fouts and including TE Kellen Winslow and wide receivers Charlie Joiner and Wes Chandler. 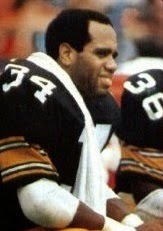 RB Chuck Muncie provided power and all-purpose RB James Brooks speed. Skies were overcast for the nationally-televised Monday night game at the Memorial Coliseum with just 42,162 fans in attendance. Fans were disgruntled from the long work stoppage and, as was the case at other locales in this first post-strike weekend, there were many no-shows. The Chargers had the first possession and drove 79 yards in 12 plays. Dan Fouts was quick to go to the air and completed six passes along the way, the longest to TE Eric Sievers for 21 yards, and two penalties on the Raiders helped the visitors along. But with first-and-goal at the one, three carries by Chuck Muncie netted a loss of a yard and Rolf Benirschke kicked a 19-yard field goal. The Raiders were forced to punt following their first series and San Diego moved quickly to another score, advancing 83 yards in just four plays. 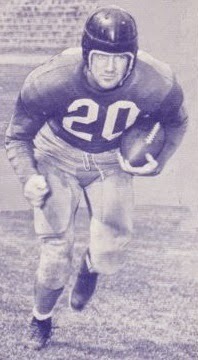 Following a five-yard run by Muncie, Fouts (pictured below) connected on passes of 12 yards to Sievers and 22 yards to Charlie Joiner. A personal foul on the Raiders added another ten yards and then Fouts threw to WR Dwight Scales for a 29-yard touchdown. Benirschke added the extra point and the Chargers were ahead by 10-0. QB Jim Plunkett was intercepted by FS Tim Fox on the next possession, but while Fouts completed passes to Muncie for 27 yards and three to WR Wes Chandler that picked up a total of 41 yards, the Chargers ultimately had to punt. As the game headed into the second quarter, the Raiders also punted and, with good starting field position at the LA 48, San Diego moved quickly down the field. Fouts had completions to Chandler for 24 yards and Kellen Winslow for 19 yards to reach the five yard line, and two plays later Muncie ran up the middle for a two-yard TD. Benirschke added the point after to make it a 17-0 contest. The Raiders moved well on their next series as Plunkett completed three passes, the longest to WR Malcolm Barnwell for a gain of 25 yards. Marcus Allen picked up 15 yards on a sweep and HB Greg Pruitt ran for another 13, but after reaching the San Diego 29, Plunkett was sacked by DE Leroy Jones for an 11-yard loss and then was intercepted by LB Cliff Thrift. The Chargers made the most of the turnover, going 57 yards in six plays, although it was a 42-yard pass interference penalty on CB Ted Watts that moved them all the way to the LA two. Muncie dove for a one-yard touchdown shortly thereafter and, with Benirschke’s PAT, the visitors extended their lead to 24-0. Now in a deep hole, the Raiders stormed back. Plunkett completed five passes, with throws to WR Cliff Branch for 16 yards and FB Kenny King (pictured at left) for 28. Allen ran effectively, including a 17-yard carry on a trap play. But Plunkett was again thrown for a loss while rolling out on a third down play and Chris Bahr missed wide to the left on a 36-yard field goal attempt. LA got a break on the next play, however, as Muncie fumbled the handoff and LB Ted Hendricks recovered for the Raiders at the San Diego 17. 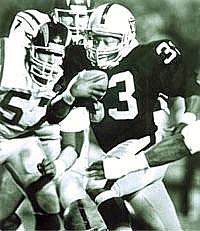 Five plays later, Plunkett connected with TE Todd Christensen for a one-yard touchdown to finally get the Raiders on the board. Bahr converted and the score was 24-7 at halftime. The Raiders punted after a short series to start the third quarter and the Chargers lost ground due to two penalties and a sack of Fouts by Hendricks. Maury Buford punted and the shanked kick traveled only 27 yards to the LA 36. Plunkett came out throwing, hitting Christensen twice for 11 and 12 yards. King and Allen then combined for 40 yards on the ground with the star rookie gaining the last three for a TD. Bahr added the PAT and San Diego’s lead was cut to ten points at 24-14. Following the kickoff, Fouts threw to Winslow for 21 yards to midfield, but three plays later Winslow fumbled when hit by DB Odis McKinney after catching a short pass and NT Ruben Vaughn recovered for the Raiders. LA scored again in four plays, highlighted by King running for a 21-yard gain up the middle, and Allen swept for the last three yards and another touchdown. Bahr’s extra point made it a three-point game. The teams traded punts to finish out the period and San Diego started off the fourth quarter with a drive to the LA 15. James Brooks picked up 23 yards on three carries and Fouts had passes to Winslow for 15 yards and Chandler for nine. But the Chargers came up empty when Benirschke missed a 22-yard try for a field goal. The Raiders responded by going 80 yards in nine plays. Plunkett was successful on three passes, including one to Christensen for 24 yards on a third-and-three play, and Barnwell gained 14 yards on a reverse. FB Frank Hawkins ran for a one-yard TD, Bahr added the point after, and the home team, once down by 24 points, was in front by four with 5:54 remaining to play. San Diego fought back as Fouts fired to Chandler for completions of 30 and 24 yards. 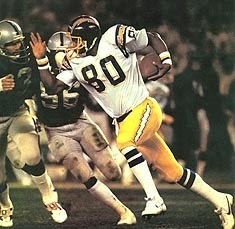 But after getting to the LA 18, Fouts threw into the end zone under a heavy rush and was intercepted by FS Vann McElroy. It in effect clinched the game for the Raiders as, with 1:56 remaining on the clock, they were able to maintain possession until the final seconds when Fouts threw a last desperation pass into the end zone that was batted away to nail down the 28-24 comeback win for Los Angeles. The Chargers gained more total yards (411 to 326) and had the edge in first downs (26 to 23), but they also turned the ball over four times, to two by LA. The Raiders were dominant on the ground (181 yards to 72). Marcus Allen rushed for 87 yards on 18 carries that included two touchdowns and caught 5 passes for 37 more yards. Jim Plunkett completed 18 of 25 passes for 163 yards and a TD while giving up two interceptions. Kenny King contributed 68 yards on 13 rushing attempts. Todd Christensen topped the club with 8 catches for 83 yards and a TD. 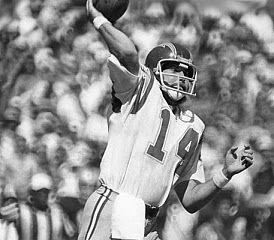 For the Chargers, Dan Fouts was successful on 24 of 42 throws for 357 yards and a touchdown while tossing two interceptions. Kellen Winslow (pictured below) caught 8 passes for 105 yards and Wes Chandler gained 118 yards on his 7 receptions. 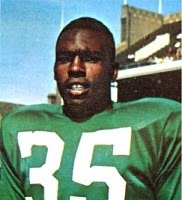 Chuck Muncie had six catches for 50 yards but was held to 23 yards on 15 rushing attempts that included two for TDs. James Brooks topped the club with 49 yards on eight carries. "I don’t know what it is about Monday night football, but we’re very proud of our Monday night record,” said Coach Tom Flores, commenting on the fact that the come-from-behind win gave the Raiders a 19-2-1 record in Monday night contests. The Raiders lost at Cincinnati the next week but didn’t drop another game during the remainder of the truncated regular season, finishing atop the AFC with an 8-1 record. With the divisions set aside, LA was the top seed in an eight-team conference postseason tournament and handily defeated the Browns in the first round before losing to the Jets in the second. San Diego, which lost to the Raiders again in the season finale, ended up at 6-3 and fifth-seeded in the AFC. The Chargers also won their first round game at Pittsburgh and lost to Miami in the second round. Marcus Allen continued to have an excellent first season, receiving consensus first-team All-NFL and Pro Bowl honors as well as Rookie of the Year recognition. He rushed for 697 yards on 160 carries (4.4 avg.) and caught 38 passes for another 401 yards to lead the league in yards from scrimmage with 1098. His 14 touchdowns also led the circuit, as did his 84 points, making him the first rookie to lead the NFL in scoring since Gale Sayers in 1965. As he had in each of the previous three seasons, Dan Fouts led the NFL in passing yards with 2883 and also topped the circuit in TD passes (17, tied with Terry Bradshaw and Joe Montana) and yards per attempt (8.7). Kellen Winslow led the AFC in pass receptions (54) and Wes Chandler topped the league in pass receiving yards (1032). All three received consensus first-team All-NFL honors and were selected to the Pro Bowl. Converted to linebacker as a freshman in college, Urlacher had two nondescript seasons before Rocky Long became head coach at New Mexico and gave him an enhanced role in which he acted as a defensive back as well as linebacker. The versatile Urlacher also saw action as a kick returner and wide receiver, the latter role in which he caught six touchdown passes. As a junior, he led the team with 178 tackles and received All-Mountain West Conference honors and in 1999 he was credited with 148 tackles and five forced fumbles. 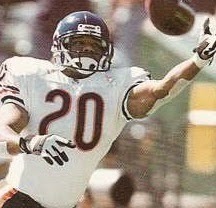 He received All-America recognition from several sources and was the first round draft choice of the Bears in 2000. Urlacher had an immediate impact as he proved to be ideally suited to playing middle linebacker with his speed and tackling ability in the open field, as well as excellent instincts. Bears went 5-11 to finish fifth in the NFC Central. Urlacher was selected to the Pro Bowl in each of the next three seasons and was a consensus first-team All-NFL selection in 2001 and ’02. After being limited to nine games in an injury-plagued 2004 season, in ’05 he was named NFL Defensive Player of the Year by the Associated Press in addition to receiving All-NFL and Pro Bowl honors. 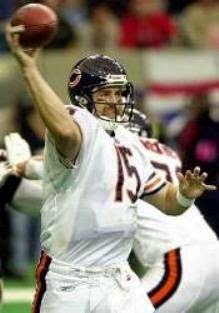 Urlacher was again a consensus first-team All-Pro and Pro Bowl selection in 2006 as the Bears won the NFC Championship. He began to show signs of wear later in the decade and, after typically being a durable player, missed all but one game in 2009 due to a wrist injury in the opening contest. But Urlacher returned to Pro Bowl form in 2010 and ’11 before finishing his career in 2012. Overall, over the course of 13 seasons and 182 games, he accumulated 41.5 sacks, 22 interceptions, 15 fumble recoveries, and over a thousand tackles. He scored five touchdowns, one of which came on his only pass reception. 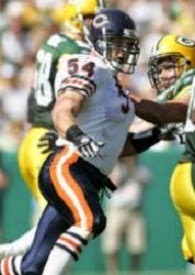 Urlacher was a consensus first-team All-NFL selection four times and was chosen to eight Pro Bowls.